I’ve got a couple of blog posts in draft form at the moment but otherwise am not feeling particularly inspired to blog. So I’m showing you one of my favourite photos on my Flickr page. I took it with my old Kodak digital and it worked out really really well. It was on my last morning on Kangaroo Island the when I was there two years ago. I got up especially early to see the sunrise over Vivonne Bay. Don’t tell anyone, but Vivonne Bay is one of the most spectacular beaches I’ve ever been to. It’s quiet and beautiful and you feel like you own the beach. I know my dog sure does and if she saw anyone in the distance she’d run up and check them out because they dared to come onto her beach. She even cornered the owner of the place we stayed at once and I had to go and rescue him. She wasn’t being vicious, just protective. Oh how I wish I was there right now. See the rest of the Kangaroo Island set. Fantastic picture. Your not the only one who would love to be there! That is a beautiful photo – well done. That is just gorgeous Jen. Looks pretty inviting I must say. Thanks. that is a glorious photo – what a picture you captured Jen. I love it. 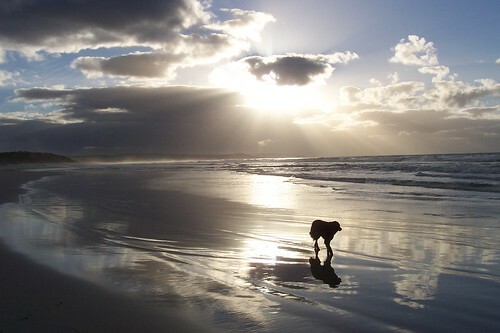 I need a beach walk too and a sunrise ! not the sons rising early.